Earlier this morning we explored the subject of Canada’s non-car-oriented vehicle market. 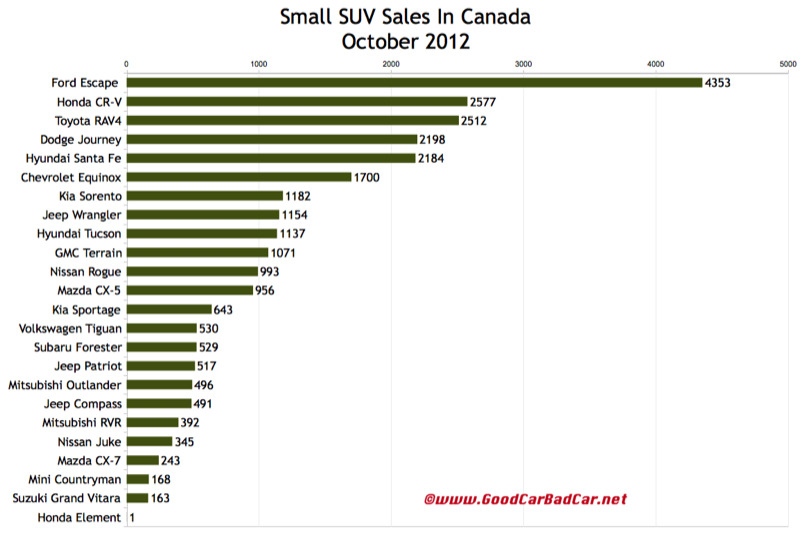 Canada’s best-selling cars are easily more popular than Canada’s top-selling crossovers and SUVs, but the growth many small crossovers enjoyed in October 2012 was something to behold. As the overall vehicle market recorded a 7.8% year-over-year improvement last month, some two dozen mainstream brand SUVs and crossovers exceeded that figure. From the Ford Escape’s 1040-unit increase, a 31% jump, to the Toyota Sequoia’s 15-unit increase, which translated to a 26% improvement, a wide variety of utility vehicles posted meaningful advancements. Toyota sold 576 more RAV4s this October than a year ago. GMC sold 242 more Terrains. Jeep sold 205 more Wranglers; Hyundai an extra 240 Santa Fes; Honda 353 more Pilots; Toyota another 379 Highlanders. Year-to-date, SUVs of one kind or another are the sixth, 11th, 13th, 16th, 18th, 19th, 20th, and 21st-best-selling vehicles in Canada when compared with all other vehicle types. 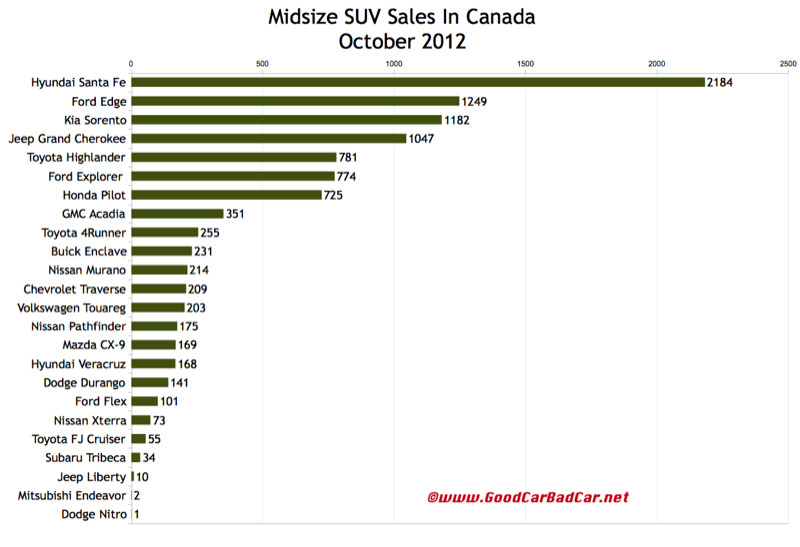 2011 ended with SUVs as the seventh, 12th, 15th, 16th, 17th, 19th, 23rd, and 24th-best-selling vehicles in Canada. Too many numbers? Put simply, Canada’s eight leading utility vehicles rank higher this year than they did last year. Not all SUV types are vital to the health of Canada’s auto industry. The seven full-size SUVs in the table at the bottom of this post and in the accompanying chart accounted for less than one half of one percent of the overall new vehicle market in October. 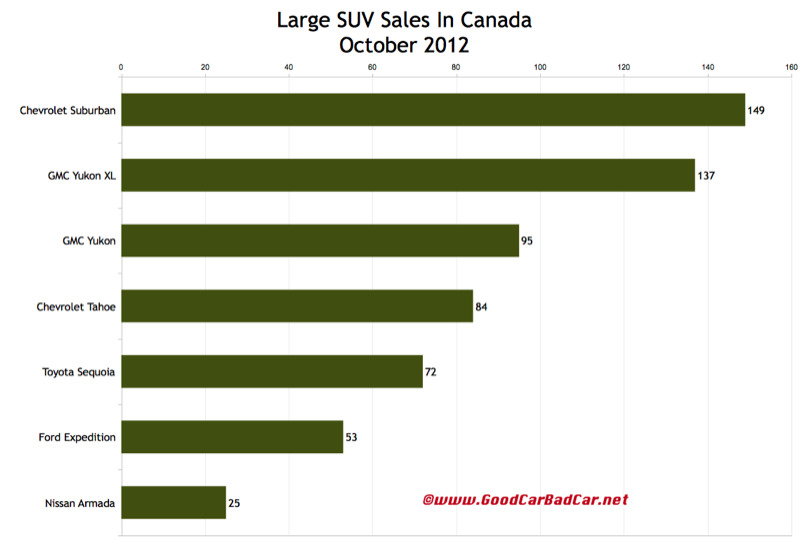 The tables visible after the jump break down Canada’s October 2012 SUV/CUV situation with detailed year-over-year and year-to-date sales figures. The Volkswagen Touareg has been added to the midsize SUV table but we’ll also be showing it with the more similarly-priced midsize luxury SUVs. If the vehicle you’re looking for isn’t grouped together with these SUVs, it may be listed with cars, with luxury SUVs, or in one of the other segments you can access through the eighth dropdown menu on GCBC’s Tally page.